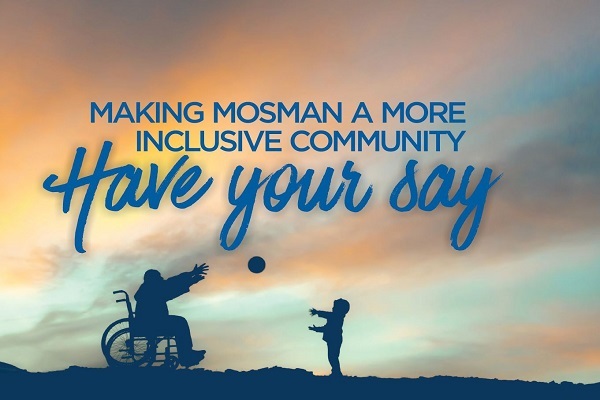 Mosman Council is developing a plan to make our community more accessible and inclusive of people with disability. Council has started to identify the barriers that people with disability might face and things to do to overcome these. View the Disability Inclusion Consultation Guide for more information. Participate in a consultation on Wednesday 14 September at Mosman Seniors Centre. Sessions are being held at 1-2.30pm or 6-7.30pm for people with disability, carers and family or community members, and 3.30-5pm for service providers. To register book online via trybooking.com/220403, email l.morgan@mosman.nsw.gov.au or phone 9978 4257. Please register by 7 September. Undertake a brief online survey. The survey closes on 16 September 2016. A poster for the Disability Inclusion Community Consultation Forums is available here.